At Noon on Saturday, S.A. Williams will sign copies of her book, “Anna’s Secret Legacy,” a compelling World War II story that finds an American pilot and a brilliant female research scientist on the run because of her discovery that can either revolutionize medicine or — in the wrong hands — wipe out humanity. Williams was educated in London, Paris, Madrid, Brussels and Rome. Her international background has provided an unusual cultural fluency which flourishes in her novels. The bookshop is at 16 S. Main St. in Doylestown. This entry was posted in Anna's Secret Legacy, Anna's Secret Legacy Blog, Annas secret legacy novel, Book Blog, Book Signing. Bookmark the permalink. 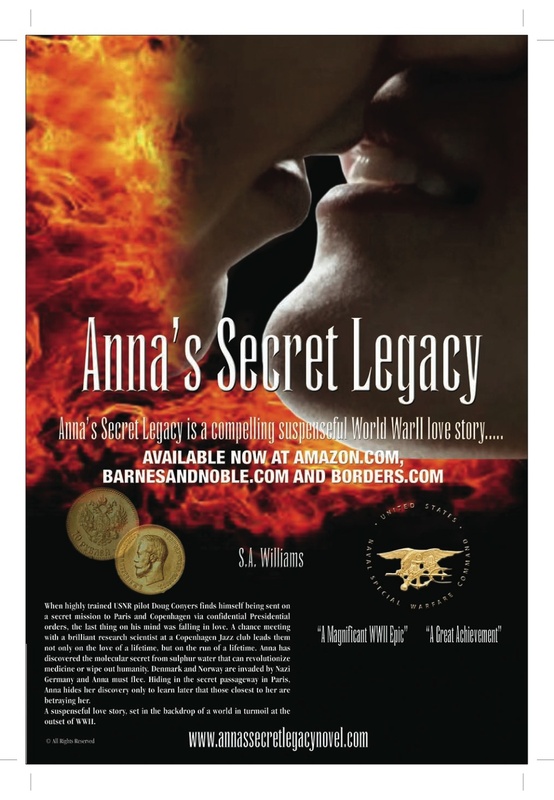 ← Author Williams of Anna’s Secret Legacy gets high marks for her film script!